Walter: I don't know what to do. June: That's all right, Walter�I'll try and show you..
One of the most difficult challenges for any actor has to be to portray a severely handicapped or mentally challenged individual. It's so easy to come off as hokey if you don't do your homework and throw yourself completely into the part. Although we could spend hours lauding many notable tries, only a select few performers have been able to become so opaque that the actor ceases to exist, thus setting up an unforgettable portrayal. Some that easily come to mind: Mickey Rooney in Bill, Dustin Hoffman's heartbreakingly touching Raymond Babbit of Rain Man, and the award-winning work of Daniel Day Lewis in My Left Foot. 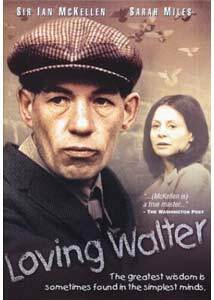 Though all rank high among my personal favorites, I think I have a new heavyweight champion in this category of storytelling: Sir Ian McKellen in Loving Walter, a highly acclaimed British television movie, truly one of his best. Based on the best-selling novels, Walter and Winter Doves, by writer David Cook, the Shakespearean actor takes us on a gripping yet uplifting journey as the film's mentally challenged namesake, from painful late adolescence to middle age. Born to a highly religious mother (Barbara Jefford) who can't seem to stop referring to his existence as a mistake of God (even into teenage years), subjected to indifference, mockery, and impatience on the part of his packing factory co-workers, and given next to no emotional support from his silent and distant father, it seems as though the only bond Walter manages to find are with his father's pigeons, who could care less about his affliction as he returns their unconditional love. Then in almost simultaneous tragedies, Walter's world is turned upside down; he cannot internally fathom or realize that his parents are gone. For days, he waits patiently by the bedside of his mother, feathered companions nearby, hoping she will awaken. Soon, the social system gets wind of the situation and a disheveled Walter, covered in bird droppings, is dragged kicking and screaming from a troubled but sheltered sanctity he will never experience again. Placed in a barely functional institution and surrounded by the disturbing actions of his fellow inhabitants, Walter's courageous, unwavering spirit carries him through the realization that he's one of the lucky ones. His self-taught scholastic skills and reasonably competent work abilities are taken advantage of by the hired help who want as little of the dirty work as possible. Passing years lead to a somewhat comforting, yet lonely complacence, but hope emerges via an infatuation with June (Sarah Miles), a beautiful but mentally disturbed woman whom he finds love with. But shadows of his past continue to taunt his soul. Told with unflinching honesty by director Stephen Frears (working from Cook's screenplay), Loving Walter is not an easy watch, but McKellen's extraordinarily portrayal of a man whose indomitable spirit never wavers even against the bleakest of situations, is impossible to ignore. Almost unrecognizable behind dentures, his mannerisms, actions, and inflections are beyond effective; in scenes mixing real life handicapped individuals and actors, you can't tell the difference—and that is a very difficult task to accomplish (though amazingly, the Oscar-nominated actor says it was one of his easiest roles). Equally memorable are supporting turns by Miles, Jefford, and an early appearance by the wonderful Jim Broadbent, who provides one of the film's few light moments as a tough-minded yet somewhat sympathetic orderly who bolsters Walter's confidence ("I've 69 babies to look after, you being my only grown up."). Image Transfer Review: As expected from a European television film of 1980s vintage, visuals are not of feature film caliber. Though the desaturated, documentary style is definitely what the filmmakers were aiming for, the inconsistent colors and poor black levels were not. My thinking is that the source material is a low generation video master; not the worst I have ever seen, but I feel better materials could (and should have) been unearthed. Audio Transfer Review: An adequate, unremarkable Dolby Digital mono track. Somewhat compressed to my ears and lacking in proper equalization, with certain passages extremely muffled (which made it difficult to understand some of the thicker British accents). Extras Review: It's a testament to the quality of Loving Walter that McKellen, Frears, and Cook return to this project for thoughtful and highly informative interviews. Cook's sit down is the most interesting as he recalls the roots of his novels, which took shape following a nervous breakdown he suffered early in his career. Originally, June was slated to be the central character of the books, but a chance meeting with a mentally challenged worker at a local Woolworth's altered his plans for the better. McKellen's chat is equally informative as well as being the lengthiest of the three. Clocking in at just over 24 minutes, this actor's actor is ceaselessly interesting. Recalling his involvement in the project from the lengthy development to eventual production, many memories emerge, the most notable being his commitment to authenticity when Frears opted to use more genuinely handicapped extras in the film. Given all his pre-shoot research, the role turned out to be one of the easiest of his career, illustrated as he effortlessly reprises Walter's mannerisms. Frear's contribution is frustratingly short, but he offers a couple of interesting tidbits (Walter was one of the first films in Britain to utilize the recently introduced steadicam; the decision to forgo utilizing actors in the mental institution sequences at the 11th hour). Rounding out the package are biography/filmography sections for McKellen, Miles, Frears,, and Jefford, and Futile Treatments of the Mentally Ill, a fairly interesting text section that details the history of medical treatments from the times of ancient philosophers to modern day techniques. One garish example comes from the efforts of 16th-century Dr. Daniel Oxenbridge, whose regimen consisted of bleeding a patient over a series of days, then placing animal lungs atop the poor soul's shaved head. A stark and haunting peek into the soul of a mentally-challenged man brought to life by Sir Ian McKellen in a remarkable performance, an equally flawless cast, and unflinching direction from Stephen Frears, Loving Walter is one of the finest made-for-television exports to ever cross the pond. Although its sonics and visuals deserved better for its DVD debut, the inclusion of supplements featuring candid interviews with the creative minds behind the movie make the technical sins forgivable.